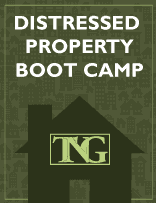 Our Summer Property Buying Boot Camp is approaching quickly. Join us in our office in Riverside with a very small group to hear the inside scoop of what it takes to be a better California real estate investor. We get rave reviews from novice and experienced investors alike and we’ve made lots of important adjustments to get you best prepared for this market. This is the closest thing to “coaching” The Norris Group offers since it includes a one-on-one private session with Bruce Norris after the training at no additional charge to discuss whatever you need to hit the ground running. We’re only doing this three times this year so the next boot camp will be late spring or early summer. The boot camp has changed as we focus on new strategies for the year. Fore questions you can call me direct at 951-823-8266. We’ll show you how to take a comp and multiply your deals. Every wholesale comp is evidence that someone made a decision to sell a property at a below market price. Almost every time, that’s the end of the value of that deal. We will show you how to sequentially walk that wholesale comp around so it creates more deals and more profit for you. The bulk of your deals will now come from talking to people who own a property. The first thing you have to learn is how to get a seller to call you with what they have. Together, we will tear apart some 20 mailing pieces to see what works and what doesn’t. Then, from what you’ve learned, you will customize your own mailing piece. We will take a look at the most popular websites that attempt to attract seller responses. We will call fellow investors who have signs, ads etc. The goal here is to create relationships with people who are finding more properties than they can handle and have some of their excess properties sent your way. Bruce will cold call a few of these people so you can get comfortable with having the conversation. **The Norris Group has created a new division dealing with buying wholesale flips from fellow investors. You’ll hear about flipping wholesale deals to us (you get paid by working with us) or using our money and partnering with us. In what we call Quadrant #4, we can either be your competitor or a potential partner…we have chosen the latter. You can still borrow money from us, but you may be able to flip us a property or find a deal we can partner. That’s exciting! We’ll get down to the reasons all-cash offers should be considered by many sellers. If you do not know how your offer helps a seller, you won’t buy many properties. You have to understand what the seller’s circumstance is and what the seller want’s. During this segment, Bruce will be open to having investors who are close to putting a deal together call and discuss strategy on speaker phone. In some cases, Bruce will get on the phone and talk to the seller directly. Appraising in the Real World. If you are going to find deals that are profitable, you’ve got to understand appraising. If you are going to flip us properties, you have to see properties through our eyes! We will spend a half day with our real estate appraiser, Rick Solis. You’ll learn how to quickly get an accurate value of the property you are looking to buy. Putting the correct value on the property is where it all starts! Knowing the correct ARV is the first step in finding out if the deal makes sense. Rick is going to show you the ropes, and then we will be putting your new skills to work in the field actually appraising a property recently purchased by an investor. No BS…this is the real deal! Your evaluation and comps will be compared to one of Rick’s actual appraisals. You’ll have to explain how you got to your value. This is extremely valuable and new! When you get to the last property, you will be asked to write up your own repair list. When we get back to the office, your estimate of what needed to be done will be compared with what we found. Then, we will show you how to use our automatic repair estimator to help you get to what the repairs actually cost. This is very important! If you want to buy properties profitably, you must understand what is necessary to repair and how much it costs to repair it. If you intend to flip us a property, you have to be able to do a repair estimate accurately. Aaron will show you how he uses the internet to make The Norris Group a household name. He’ll give you some tips on branding and where technology is headed so when you set up your brand, you do it right the first time. He’ll also show you some tips and tricks on PropertyRadar to help you smartly target your desired market. Bruce will finish up by going over his top ten lists of contacts, web sites, charts, and books he uses and recommends! Bruce has also agreed to give each person attending a 30 minute consultation over the phone or in person; your choice within 30 days of the boot camp. Bruce will set up two days to see people at the office or, if by phone, we’ll figure out a mutually good time within the 30-day period. There’s no better way to get your investing career off the ground quickly. Both experiences and novice investors have attended our boot camps over the years. Included in the boot camp is a quarterly webinar for boot camp attendees for the first year. You’ll be able to ask questions, discuss deals, and share insights quarterly with Bruce and other attendees. And, as always, our team is here by phone to answer questions. Space is limited! There’s no up selling, there’s no fluff, and even the most successful REO agents and long-time investors have raved about their experience at our boot camp. You learn relevant information from someone actively buying California real estate in today’s market. Need some motivation? Check out the deals we fund every day through our hard money lending department. Because we’re in the market buying and actively funding other investor purchases every day, we know the most appropriate strategies to buy today.